STOP! If you are transitioning from military service to the civilian work force, aiming for a white-collar desk job, you need to see this before you apply for even ONE position…. Hi, I'm Peggy McKee. I am a recruiter, a career coach, and the CEO of Career Confidential, a company that specializes in training job seekers in how to get great jobs fast. We have worked with more than 10,000 job seekers just like you to help them have a faster, better job search. I know you've heard that it's difficult to transition into a civilian job. I know you'd be excited and happy, but you'd probably also be relieved. You'd be able to provide security for you and your family at a time when a lot of your peers are going to end up unemployed on their mother-in-law's couch. It doesn't make any sense that veterans can't find jobs….you're the best of the best: highly trained, disciplined, you have a strong work ethic, you're all that. But it is a fact that if you're a veteran, you are less likely to get a job. I talked to an executive this week who told me about a guy just like you…transitioning out of military service, in the job search for a civilian position. My executive friend was talking to the person doing the interviews, who said he wasn't having much luck. He'd thought this guy with a military background might be promising, but the interview didn't go well and he was going to pass. My executive friend has a military background himself, so he felt that kinship and asked for the guy's resume. Just to see. "Wow! How could you pass on this guy? He has a STELLAR background. He's had positions of great responsibility, he's highly skilled, and we need those skills in our organization. We can't afford to pass on him. We have to talk to him again." Can You Communicate Your Value? So what happened? This executive, because he had a military background himself, could see what the interviewer couldn't. He understood the resume and saw the transferable skills. He recognized that this guy's skills were valuable—BECAUSE he happened to have a military background, too. The interviewer didn't have that background, so he couldn't see it. He wanted to, but he just didn't have the frame of reference to recognize those kinds of transferable skills. And—now this is important, too—the guy, the job seeker, couldn't communicate any of it in the interview. He did not know how to show the interviewer his potential value to the organization. He couldn't do it with his resume, and he couldn't do it in the interview. This may be YOUR problem, too. Most corporate executives and managers can’t recognize your value on their own. They don't understand the alphabet soup of all the abbreviations of names and organizations and terminology that you use. They don't know the true value of the jobs you've done or the positions you've held or even your rank. You can FAIL to communicate that value to those employers, and you won't get the job. They won't know why they should hire you. You can't count on a miracle. You've got to make this happen yourself, and you've got to do it in a hurry. Why do you have to hurry? Well, first off, I assume that you don't have a fat stack of cash sitting there to cushion you while you take your time in a job search. You've got to make ends meet, and that requires getting a paycheck quickly. Second, you've got a lot riding on this.More than you know. If you step out in this job search and you get rejected, what's that going to do to you? It hits hard at your sense of self-worth. If you're out 3 months, you start to think that maybe you're not all that and no one wants you. You get a little more desperate. So IF you get a job, you end up taking one that's way less than what you're actually qualified for. That job comes with a lower salary, too. If you start out with a lower salary, you'll have a lower salary for the rest of your career. It's a starting benchmark that you can't get away from. So you suffer, and your family suffers. You deserve better than that. You deserve a fast, smooth transition from your military career to a civilian job that pays you what you're worth. So how are you going to get it? You need a resume that doesn't just say what you did….it has to act like a marketing brochure that sells you to potential employers. It communicates your value and "sells" you before you've even said a word. When your resume sells you, you end up with a lot more interest in you as a candidate. Once you have a great resume, you need to find great jobs to interview for. Do NOT think you can just go online and apply for what's open. You'll shoot yourself in the foot if you do. You need a targeted approach that puts you directly in front of the people who matter, and that's your future boss. When you focus on that person, you end up with lots of interviews. In your interviews, you have to communicate your value in a way that makes sense to them. You have to sell yourself for the job. It's easier than it sounds. You don't have to act like a used-car salesman to sell yourself. All it takes is some strategy and a couple of communication tools. Anyone can learn how to do this. You can't just choose one of these things and hope it works. If you write a great resume and blow the interview, you won't have a job. If you get great at interviewing, but you don't have a good resume, you won't get a chance to talk to them. If you have a great resume and interview skill but no companies to talk to, you won't get a job. You need everything working together. I personally care a lot about our military veterans. You've made great sacrifices for us with your service, so I want to do something for you. I have put together a package specifically for military veterans to teach you how to get a job in the civilian workforce. It incorporates all 3 of these vital factors we talked about, and more. I call it Mission: Transition. Mission: Transition is the bridge you need to get from your military job to a civilian job...it will help you be wildly successful with your job search. It's NOT a series of lectures. It's NOT "death by PowerPoint." There's NO boring classroom to sit in while you're trying not to fall asleep. It's me, coaching and training and teaching you all about your job search. You get all the strategies and tips and shortcuts that make you very successful very fast. It's a collection of tools that make all these new things you have to do very simple and easy. And it's all delivered through video that you can watch anywhere, anytime you want. If you need to be working on this at 3 in the morning, you can do it. If you have to do it while you're out of the country, you can do it. As long as you have internet access, you can get this done anytime and anywhere you want. We start with showing you, step-by-step, how to write a strong resume that 'markets' you to employers. It will clearly show any hiring manager how your skills can help them and why they need you. It will sell you before you even say a word, and you won't miss out on any opportunities. It's all in a resume writing kit with coaching….my Extreme Resume Makeover Kit. It makes writing a powerful resume easy. To make it really easy, I've even included a fill-in-the-blanks template. All you have to do is fill in your personal details and it's done. Your resume will look exactly like it's supposed to look—no muss, no fuss, no worries. You Also Get a Personal Resume REVIEW! And when you're done (make sure you read this) you can send it to me and I'll look it over for you. That means you get an expert opinion and personalized feedback on the most important document of your job search. You will be guaranteed to have a top-quality resume that represents you very well. Once your resume is ready, I'll show you how to find relevant companies to send it to with my Hidden Jobs Finder. Why a Hidden Jobs Finder? There are a ton of available jobs that very few people know about. They are hard to find unless you happen to know someone who knows someone. With the Hidden Jobs Finder, you don't need that giant network. You can find them on your own. You can even search for and find military-friendly contacts at companies. Actually, the Hidden Jobs Finder is even better than a giant network of corporate contacts. With this system, you can find and contact hundreds of hiring managers at a huge variety of companies within your field, anywhere in the world. A hiring manager is someone who could be your boss or your boss's boss. That's the person with the authority to hire you. With this system, you can easily contact 200, 300, or even 500 of those very important people and put your resume right into their hands. Contacting hiring managers directly and getting your resume in front of them is one of the most mission-critical things you can do in a job search. Why? Because right now, in this job market, thousands of people are competing for the same jobs you are. If you just send your resume off to Human Resources, or worse yet, fill out an application online, you'll get lost in the system and you won't get interviews. But if you put a very strong resume directly into the hands of decision-makers, then you DO get called for interviews. And what happens if you do that over and over and over again with hundreds of contacts? You get lots of interviews. You Can Have As Many Interviews As You Want…. But when you contact them you have to say something, right? You have to write something good in that email so they'll look at it and take action to call you. So I also included dozens of messages that have been proven to get great responses from hiring managers all over the world. All you have to do is copy and paste a message, insert your personal information, and send it. The entire thing is amazingly simple, but extremely effective. If you can follow directions, you can be wildly successful with this system and end up with as many job interviews as you want. Now…when you get those interviews, you have to crush them. This is the third piece. The key to performing well in an interview is good communication. It's especially important when the translation of your skills to their company isn't always completely clear. So I'm going to train you on how to communicate your value to that interviewer so they can clearly see why they need to hire you. We'll start with straight coaching: my Strategic Approach to Interviewing. If you're in the military, you understand the importance of strategy better than most people. Having a goal and a strategy to get there is critically important to your success, and that's also true in interviews. You have a goal in this interview, and you must hit it to move to the next step. With this training, you can hit your goal every time. You will understand the 4 most common concerns of every hiring manager, so you can address them before they keep you from getting the job. You will know how to be "over-prepared" for every interview so that you are strong and impressive as a candidate. You will learn strategic ways to answer interview questions, so you sell yourself with every answer. You will know the best questions to ask so you can uncover information that helps you move forward. You'll even learn the one question that boosts your chances of getting the offer by 30%-40%. You will learn all the most important interview do's and don'ts. With this training, you'll be able to definitively show them why they should hire you. You also get my comprehensive Job Interview Prep Kit. The Job Interview Prep Kit is set up like a workbook that takes you through each step of preparing for your interview. This is what makes sure you don't forget anything and leave a hole in your prep work. It even comes with video training so you get to hear all of the extra tips and ways to think about what you're doing so the result is top-notch. To go along with all this prep work, you will get the most impressive interview tool any hiring manager has ever seen: the 30-60-90-Day Plan. So what is a 30-60-90-Day Plan? It's a written outline for what you intend to do in your first 3 months on the job. It's divided up into your goals for the first 30 days, the next 30 days, and the last 30 days. You do some research into the job and the company, so you write it out and tailor it for that job, and then you bring it to the interview and talk it over with the hiring manager. Why do you need to create a plan like this? This plan has gotten people more job offers than you can imagine. Even if you've never done the job before, it shows them that you are fully capable of doing it well. You are someone who goes the extra mile, and someone they need on their team. It even affects the psychological mood of the interview. When you talk about it with the hiring manager, it starts to make him see you in the job. Once he sees that, he's already a long way down the road to making you the offer. That's why you need this plan. What I do is show you the fastest and easiest way to put together one of these plans. I've coached hundreds of people on all kinds of careers on their plans, and I've put all that collective wisdom into a time-saving template for you. I'll show you exactly what goes in your plan, so you won't have to wonder. I'll show you where to find all your information, so you won't waste time. I'll coach you on how to present it and talk about it in the interview, so you get the maximum benefit out of it. You will sound smooth, confident, professional, and corporate. They will look at you with respect when you have this plan and they will want to hire you. Just like when you sent me your resume to review it for you, you can send me your completed plan and I will give you feedback on it and tell you if it's good or where it needs additional information. You will be so confident in your plan that your interview is going to go better than you ever imagined. And finally, when you get the offer, I will show you how to figure out if it's a good one, and how to negotiate for a better one if necessary. It's hard for you, or anyone, to know what you're worth in the open market. Your military pay grade is different from the corporate world, which makes it more difficult. You do not have to worry. I have a special training that will show you how to determine what you're worth and tell you exactly what to say in a very positive interaction to get the salary, benefits, and perks you deserve. And then I'm putting on the finishing touch…because it's difficult to go through a job search on your own, I have an exclusive group coaching club that gives you personalized training. Everyone in the club starts with 9 in-depth training videos for every step of the job search…resumes, interviews, phone interviews, follow up, and more. These are ADDITIONAL training videos. There's nothing we don't talk about and give you the best information for. Then, we meet every other week online, so you can attend from anywhere in the world. I do a quick presentation on a variety of job search topics, and then open it up to questions from members. If you have a question about your job search or some problem you've run into, you can ask it in those meetings and I'll give you a solution for whatever it is. You can even go back and listen to past meetings. They're all recorded and saved, since we began the club. This personalized coaching has proven to be incredibly valuable for our members. It's a popular club. It removes the uncertainty and the potential mistakes and replaces them with step-by-step plans and strategies and tools that get you a job. Do you see how it will save you hours and hours of learning to do these things on your own? How long would you have to look for 'how to write a resume' online to learn how to do it? How could you be sure that what you learn will be effective? How many weeks would it take you to dig through hundreds of companies who might have jobs in your field? How many hours would it take you to research interview tips? And when you do, you're stuck with a trial-and-error process. You won't know what works until you try it, and you will waste precious time. You will lose some great job opportunities. Mission: Transition makes this whole difficult, uncertain process very easy for you. It's all laid out step-by-step. You don't have to reinvent the wheel. All you have to do is drive the car. Do you see how much faster you will be able to find a great job with this package? Everything in it has been tested and proven to work over and over again. What Would A Fast, Successful Job Search Mean For You? What would it mean for you and your family if this major life change you're about to undergo were smooth and easy and stress-free and successful? How would it feel to be able to tell your spouse, your friends, your parents, and your mother-in-law how many interviews you have or how many job offers you got? How would it feel to know that you grabbed a great job that pays you what you're worth? What would it mean to you to move into the civilian workforce knowing how valuable you are? I know you want all those things. Who wouldn't? But why should you believe that I'm the one who can deliver them for you? That one's easy. I can deliver these kinds of results to you because I have been there and done that with thousands of people before you. Over and over again, my brand of aggressive, powerful training has been proven to get jobs quickly. The Extreme Resume Makeover kit teaches you how to showcase your skill set in corporate language hiring managers respond to so you get calls for interviews. The Hidden Jobs Finder shows you the fastest and easiest way to find great jobs and get interviews for them so you have more than one or two opportunities to choose from and you don't miss out on a great job because you didn't know about it. Edward applied twice to the same company and got no response. Then he used the Hidden Jobs Finder system to contact the VP of Technology Delivery who forwarded his resume along through the channels and he got an interview. That's the power of contacting hiring managers directly. The Strategic Approach to Interviewing, the Job Interview Prep Kit, and the 30-60-90-Day Plan all work together to communicate your value to those hiring managers so that they're practically begging to hire you. The Total Access Club can literally change your life. There's just so much information there about how to be more and better and stronger in your job search and interviews it will help you for the rest of your career. And the Salary Negotiations Training makes sure that you get a fair salary with the perks you deserve. They won't be able to lowball you when you know these tips. You When You Have All This On Your Side? You're going to enjoy this same kind of success. You'll find lots of jobs and contact hundreds of hiring managers, get lots of interviews with my Hidden Jobs Finder. You'll be sure to get paid what you're worth and easily handle all the discussions about vacation time, relocation, health care, bonuses, and all the other perks and benefits that are a part of corporate compensation packages with my Salary Negotiations Training. So the most delicate discussion of the entire process becomes a lot less scary. You get personalized coaching for the whole process with the Total Access Club. This massive task in front of you with all those moving parts and pieces involved in getting a job will be doable and easy because I've made it easy for you. Successful Job Search…But How Much?" And now you're probably thinking, "Peggy, that sounds great. I would love to have my transition and my job search be that easy and that successful…but how much does it cost?" I want to make sure you understand the value of all these things. Remember I told you I was a career coach? That means that I personally work with candidates every day to help them find and get jobs. I charge $250 an hour for that coaching. With all of the coaching I do in these trainings, plus the Total Access Club videos and meetings, that adds up to more than 54 hours of training for you. Given what I charge per hour for this very same information that I teach job seekers every day, that 54 hours of training is worth more than $13,520. I've put hours and hours into researching and organizing and putting those together so that you have the very best of the very best tools to reach your goal. You need the best tools and the best training you can possibly get. This is your life we're talking about here. You need everything you can get your hands on to guarantee this transition is fast and successful for you…so I'm adding even MORE to this package. You Get 10 EXTRA Bonuses! Just to show you that I want absolutely nothing standing in your way, I'm going to add in a total of 10 extra bonuses for you. You need an online presence in today's job search, and these 2 tutorials will show you how to set yourself up for maximum impact. Recruiters and hiring managers will start contacting you about jobs, without you even having to go chase them. My LinkedIn Profile Tutorial and Facebook Profile Tutorial are each about 1 hour's worth of coaching….that's 2 hours total. If you are already living in the city you want to find a job in, great. But if you need to find a job in a city other than where you are, I'm giving you my special report on How to Job Search Long Distance. Long distance job searching has a few challenges that can keep you from being successful. My report will show you what those are and how to get around them, so you can find a job in any city in the world. You are not the only one in this picture. If you're married, your spouse has made tremendous sacrifices right along with you. Maybe they haven't worked and now they'd like to, or maybe they've got a sketchy job history that comes from moving so many times with you. So we've included an additional report: Job Search Success for the Military Spouse. It specifically addresses those kinds of challenges that military spouses face in a job search and tells you how to knock them out of your way. When you add up all 10 bonuses together, you get 3 additional hours of training and coaching worth $750. (Plus the free reports). When you put that with the core Mission: Transition package, that's coaching and training worth more than $14,370. Make no mistake…the value of this training is worth every cent of that $14,370. But I wouldn't be able to live with myself if I charged you that much. Not when you need this information so badly. I'm not charging you $10,000 for it. I'm not charging you $5000 for it. I'm not even charging you $500 for it. money-making information for only $497. That's a FRACTION of the true value of this training. It's also a fraction of the value of your salary. If you make $60,000 a year, you lose $5000 for every month you are out of work. That's $1250 every week, or $250 a day. If Mission: Transition gets you a job even a month faster, you get your investment back times 10. But that huge value and benefit for you is not even the best part…. This entire Mission: Transition package comes with a special offer ONLY for members of our United States of America Armed Forces. If you purchase the Mission: Transition package for $497 (a $14,370 value), we will DOUBLE it for you. Your spouse (or significant other) who lives with you in your household gets the identical package for absolutely FREE. That $14,370 value becomes a $28,740 value. And you pay only $497. For TWO Mission: Transition job-getting packages. This is the deal of a LIFETIME for you and your family. What Happens If You Ignore This Opportunity? If you're like most people and end up with a typical 9 month job search, then you would lose out on $45,000 (if you make $60,000….if you make more, you lose more), all because you hesitated over $497. It sounds harsh, but the reality is that I get emails every week from people who've been struggling in a job search for 6 months, 9 months, or even 15 months. They get my tools and training and all of a sudden, they're employed in a few weeks. Now, I'm not going to tell you that you have to do this right now or the price will go up. I'm just not playing that game with you. You need this, so it's going to be here when you want it. But I will tell you that it's in your own best interest to decide to do it now. The longer you are in the job search, the more your value as a candidate goes down. Employers will think: "Why hasn't anyone snapped you up yet?" After a rejection or two, you start wondering "What's wrong with me?" When you think it, you act it. You go into a downward spiral that's hard to pull out of. You don't want that, and I don't want it for you. Your family doesn't need to go through that, either. Your Biggest Worry: What If It Doesn't Work? But maybe you're worried: What if it doesn't work? Am I out $497? Of course not. I stand behind this information so much that I am willing to back it with a complete-satisfaction, 100% money-back guarantee for a FULL YEAR. You have no risk with this at all. Only benefit. This will make you a better job seeker. You will get a job faster than you can on your own. You could very easily even get a better job than you can on your own, because you'll know how to communicate that you're worth it and you'll have the confidence to do it. Get out your credit card. We take MasterCard, Visa, or Discover. Scroll down to the bottom of the page and click the big "Buy Now" button to get started. You'll fill out your name, email address, and credit card information. We'll send an email to the address you give us that will have your confirmation and all your log in details. All you have to do is follow the instructions to access all your training. Everything is online, so it can be available to you within a few minutes from now. You can get started as soon as you want. I encourage you to do this. Everything in Mission: Transition is PROVEN to deliver the results I've promised and you want from your job search. You want and need a great job as quickly as you can get it, and Mission: Transition is the way to achieve your goals. PS - Please don't leave this page to think about it. You know how that stuff works. You get busy and it gets away from you and pretty soon it's a few days or weeks from now and you forgot where it was. You'll have to start your job search without it, and it will be much more difficult. You will make mistakes and miss opportunities and cause yourself all kinds of grief that you can avoid just by clicking a button right now. PPS – Are you still hesitating? Remember, Mission: Transition takes care of everything. The Resume Kit will help you write an attention-grabbing resume. The Hidden Jobs Finder will help you get to the front of the line for opportunities the rest of the world doesn't know about yet, and it will get you more interviews. The Strategic Approach to Interviewing, the Job Interview Prep Kit, and the 30/60/90-Day Plan will make sure you can communicate your value so they are falling all over themselves to make you a job offer. The Total Access Club gives you personalized solutions to whatever you run into, because you can ask me any question you've got. You get the bonus LinkedIn and Facebook Tutorials so you are in step with corporate America and attract attention online. Your spouse gets to use the same training for FREE. That's thousands and thousands of dollars' worth of world-class job search and interview training for you AND your spouse for only $497. It is GUARANTEED (for a full year) or your money back. This is the opportunity you cannot afford to pass up. Don't think you can get this information anywhere. You can't. You can't find this caliber of information anywhere else, especially as conveniently as this is put together. I've got hundreds of emails from people all over the world that tell me that it works miracles for them, so it can for you, too. This training is universal. It's adaptable to every white-collar, professional career. It's completely customizable to fit you. What's a white collar job? Mission: Transition is completely adaptable to anyone going after a white-collar job. What if I don't have a college education? Most white collar jobs will require one, but if not, you can still utilize Mission: Transition successfully. The idea is to sell yourself to employers as a valuable asset. If your skills and experience make you valuable, you will be able to show it with Mission: Transition. What if I run into problems or don't understand something with the material? First of all, it will work. This is an investment in you, and every investment you make in your own training is worthwhile. However, this investment is backed by a full money-back guarantee. If you're not satisfied, we will refund your money. You should borrow it, either from a friend or family member, or you should put it on your credit card. Do what it takes. Our experience with literally thousands of people has clearly shown that this works. You need this. We KNOW that if you get this training and use these tools, you will be successful. It will be worth the money, and you will be able to pay it back quickly with your paycheck from your new job. What if I only need help with my resume? I think I can handle the rest. 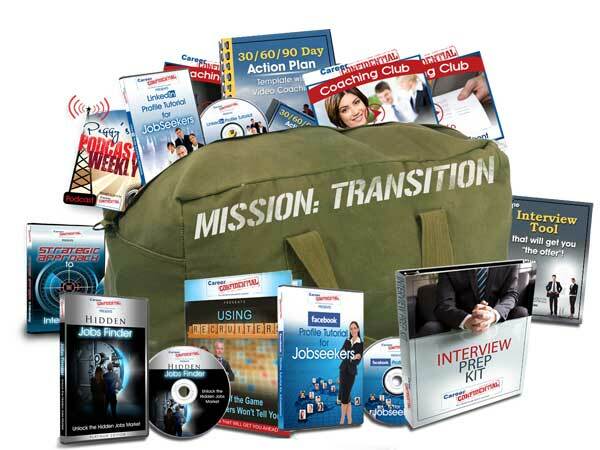 Every piece of the Mission: Transition package is available for individual purchase on our website, www.CareerConfidential.com , except for the 2 special reports on How to Job Search Long Distance and Job Search Success for the Military Spouse. So you can purchase the resume kit, and even get the personal review for free. However, it is my professional opinion that most people—not just you military types—do not have the skills necessary to find and contact hundreds of hiring managers, secure multiple interviews, communicate effectively in those interviews, and close the deal. There's a lot of skill involved in each piece that most people don't get a chance to practice and get good at, just because they don't do it very often. It's not something they teach you in school, either. What this package does is work together so that the sum is worth more than the parts. You don't know what you don't know, now do you? You've got to ask yourself, "Do I feel lucky?" (Apologies to Clint Eastwood….) Are you willing to take that kind of a gamble with something so vital to the rest of your life? I wouldn't. If I were you, I'd want everything that's proven to work so I could get out there and get it done, now. What if I need more information first? You can go online and check us out at www.CareerConfidential.com. You can learn about me, about our company, and see all the individual pieces included in this kit—you can even see comments from other job seekers about our tools. But you MUST come back to this page to get this special offer. Mission: Transition is only available right here. Or, you can call us (1-800-691-2562) and speak to us directly. Someone in our office will be glad to help you. The truth is, this package will make you better, stronger, and more than you are now. You will gain skills that will serve you for the rest of your life. Every job search you ever do from here on out will be better because you have this training. You owe it to yourself and your family to take advantage of this opportunity. Click the Add to Cart Button and get started on your Mission: Transition now.